Arrow Video has confirmed the highly anticipated UK Blu-ray release of one of our all-time favourite remakes, Phil Kaufman's 1978 version of Invasion of the Body Snatchers. The deluxe Blu-ray set will be available to own in the UK in a limited edition SteelBook showcasing the original poster artwork as well as a standard edition case with newly illustrated artwork. Both editions will be available on 18th November and come loaded with a selection of classic interviews, featurettes and newly created never-before-seen special features as well as an in-depth 52-page collector’s booklet featuring new writing on the film and archives interviews with director Philip Kaufman and screenwriter W. D. Richter and more. Remakes of great films are usually on a hiding to nothing, but Philip Kaufman’s brilliant update of the 1956 classic is a rare and memorable exception. Transposing the action to the heart of San Francisco allows Kaufman to retain all the suspense of Jack Finney’s original story while adding caustic social commentary about the selfishness of the 1970s "me generation" that remains all too relevant today. But it’s a paranoid thriller first and foremost, based on one of the most psychologically terrifying of all premises – what happens when you can no longer trust not just the authorities but even your nearest and dearest? "It was a great pleasure and great privilege to produce the UK Blu-ray of this wonderful film, one that has grown in my esteem since working on it (can it be better than the original? Yes, quite possibly.) We were very fortunate to be working from a lovely new restoration carried out by MGM. We were very pleased to be able to release the film in HD for the first time in the UK but on closer inspection further pleased to restore the original audio for the first time anywhere on Blu-ray (the scene in which Donald Sutherland and Brooke Adams are being driven by Don Siegel’s taxi driver had audio missing which is very important since it’s eventually quite clear that the radio announcer is a pod person adding a subtle creepiness to the scene!) Finally the film can be seen in glorious HD and heard as it was meant to be in both stereo and 5.1 surround sound!" 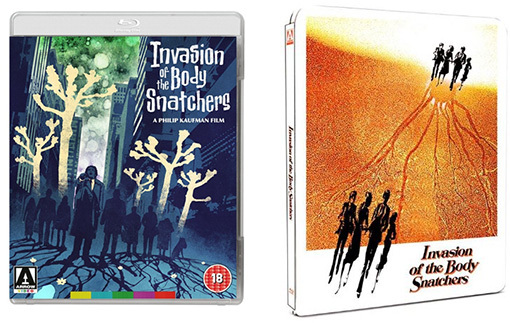 Invasion of the Body Snatchers will be released on UK Blu-ray and as a limited edition SteelBook on 18th November 2013 by Arrow Films at an as-yet to be confirmed RRP.